Hundreds of Oakland students from high schools across the city skipped class Friday morning to march from Oakland Technical High School to the school district’s downtown headquarters in a spirited show of support for their teachers, who are threatening to strike amid tense contract negotiations. “I’m here to support our teachers, to fight for things that I want in our schools and show that this is not just a teacher issue. It’s a schoolwide, community issue,” said Avelina Rivezzo-Weber, a junior at Skyline High School, who helped organize students from her school. 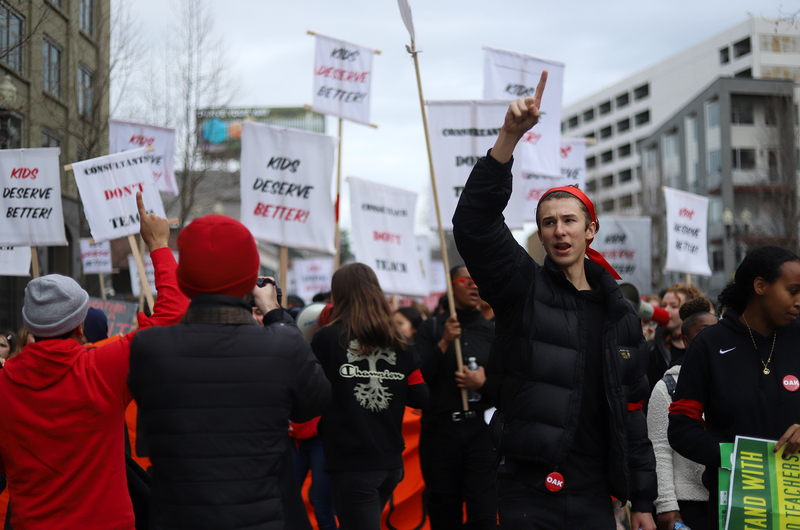 Teens gathered on the plaza in front of Oakland Tech before the start of the school day, where student organizers discussed how to demonstrate safely and then led the crowd down Broadway. Three weeks ago, teachers from many of the same schools staged a similar event, marching from Oakland Tech to Oakland Unified School District’s downtown headquarters, stopping traffic along the way. 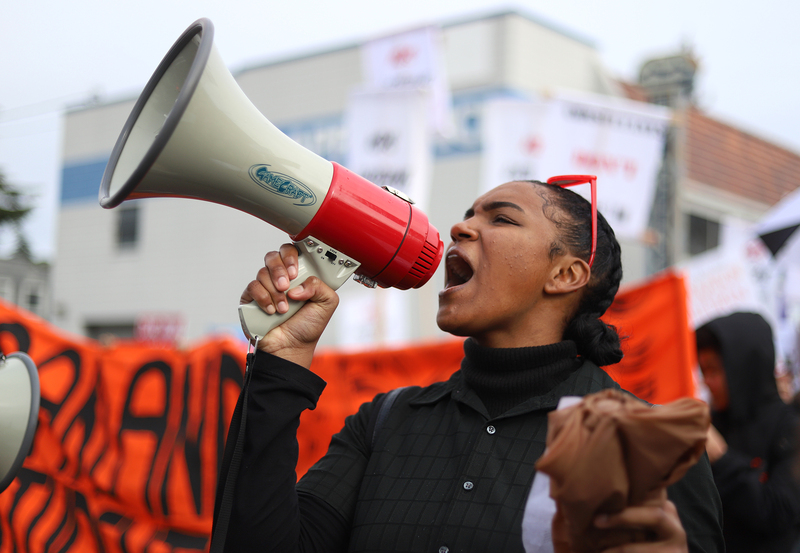 OUSD teachers, who have been working without a contract since 2017, are demanding a 12 percent raise over three years, reduced class sizes and more school counselors and nurses. Following months of failed negotiations with the district, the Oakland Education Association, the union representing teachers, on Monday announced that the roughly 2,300 teachers it represents had voted overwhelmingly in favor of a strike if their demands are not met. If the union and the district don’t agree on the recommendations of a neutral third party, expected by next Friday, the union is likely to call a strike. The impasse comes as the district scrambles to chip away at a massive budget deficit of up to $30 million. Among other measures, it recently proposed closing up to 24 under-enrolled schools, a plan the union staunchly opposes. Lauren Kahn, an Oakland Tech senior who helped organize the rally, said her teachers were very supportive of the unsanctioned walkout. “We emailed over 200 teachers, telling them of our plans and we got very positive responses back, encouraging us and thanking us for our work,” Kahn said. District officials did not share the same enthusiasm. 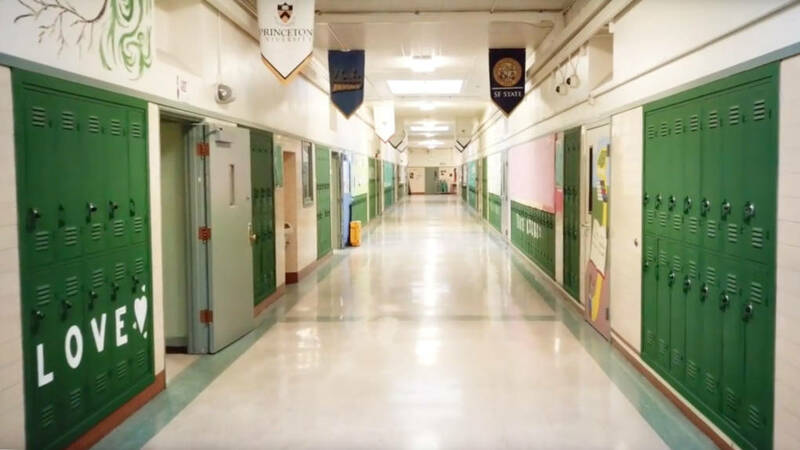 In a prerecorded call and email to parents on Thursday, OUSD spokesman John Sasaki said that while the district supported students’ First Amendment rights, it still strongly encouraged them to attend school on Friday. The district receives funding from the state based on student attendance, although Sasaki said he couldn’t yet confirm the cost impact of today’s event. A handful of parents could also be spotted in the sea of marching students. Posted in Accountability, Advocacy, Arming Teachers, Bus Safety, Department of Education, Education Budget, Educators Protest, Evaluations, Every Student Succeeds Act, Failing Schools, Funding For Education, Higher Education, Mental Health, No Child Left Behind Act, Online Education, Parents, Retirees, School Choice, School Closings, School Safety, Special Education, Students and Parents Protest, Teacher Evaluation, Teacher Shortage, Technology in the Classroom, Testing, Vouchers and tagged "Standing Strong for Public Education", #iBelieve, Accountability, Accountability System, Advocacy, Department of Education, Diversity, Education, Education Funding, English Language Learners, Equity, Every Student Succeeds Act (ESSA), Failing, Failing Schools, Federal Education Policy, HBCU, High-Needs Students, NEAExecutiveCommittee, Pension, Pensions, Public Education, School Choice, School Nurses, School Safety, State Budget, Students, Tax, Testing and Accountability. Bookmark the permalink.